Sometimes I don't get to meet a couple in person until the day before their wedding. For whatever reason, they can't make it up to Vermont before the wedding or they simply choose not to have an official engagement session. When this happens, I make it a point to stop by the rehearsal dinner (with their permission, of course!) and snap a few photos. My wedding photography package includes engagement session coverage and I want all of my clients to get their money's worth. Meeting the couple ahead of time and seeing the way they photograph naturally together is also very important to me and allows me to do my best work on your wedding day. I'll learn which poses come naturally to you and which things I need to remind you about. You'll get to know me and the way I work and we will get a feel for each other's personalities. I was a bit nervous for Amy and Tara's wedding because we had not done an engagement session, but when I showed up at their rehearsal dinner for a quick couple's portrait session, I was instantly relieved. The two have so much chemistry and photograph so naturally together. I hardly had to give them any direction whatsoever and they were knocking the intimate and romantic portraits out of the park. Plus, they're gorgeous. 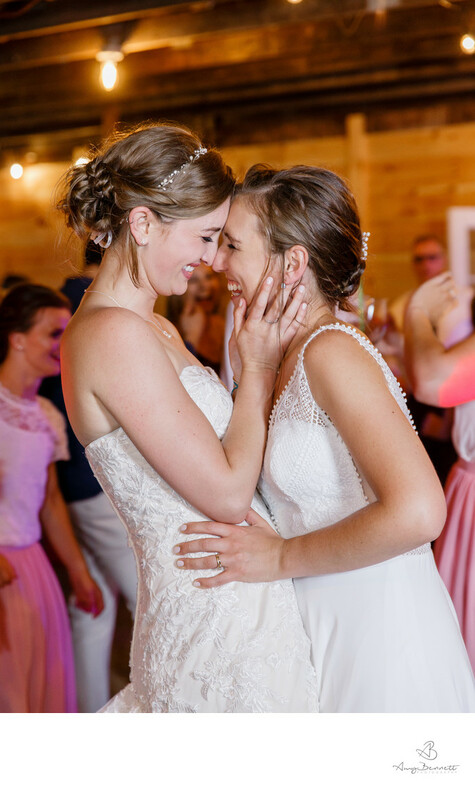 I try not to be vain, but as a photographer who spends most non-wedding days staring at people's faces on a screen (read: editing photos), I have to admit I get excited when I get a truly beautiful couple like this one. I mean, look at them! The cuteness is next level.